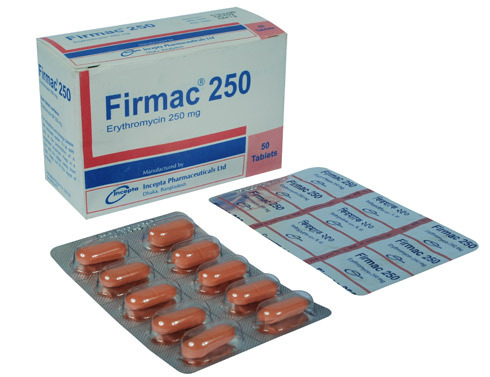 Firmac 250: Each tablet contains Erythromycin Stearate BP equivalent to Erythromycin 250 mg.
Firmac : Each tablet contains Erythromycin Stearate BP equivalent to Erythromycin 500 mg.
Firmac Dry Suspension: After reconstitution, each 5 ml suspension contains Erythromycin Ethylsuccinate BP equivalent to Erythromycin 125 mg.
Gram-positive microorganisms: Streptococcus pneumoniae, Streptococcus pyogenes, Staphylococcus aureus, Corynebacterium diphtheriae, Corynebacterium minutissimum and Listeria monocytogenes. Gram-negative microorganisms: Haemophilus influenzae, Bordetella pertusis, Legionella pneumophilia, Campylobacter jejuni and Neisseria gonorrhoeae. Other microorganisms: Mycoplasma pneumoniae, Chlamydia trachomatis, Entamoeba histolytica, Treponema pallidum and Ureaplasma urealyticum. 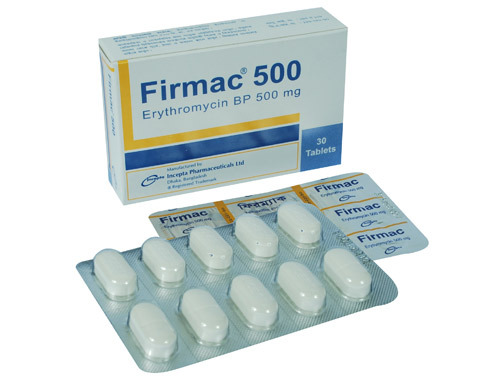 Erythromycin is highly effective in the treatment of great variety of clinical infections caused by Erythromycin sensitive microorganisms. Upper respiratory tract infections: Tonsillitis, peritonsillar abscess, pharyngitis, laryngitis, sinusitis, secondary infections in cold and influenza. Lower respiratory tract infections: Tracheitis, acute & chronic bronchitis, pneumonia (lobar pneumonia, bronchopneumonia, primary atypical pneumonia), bronchiectasis, legionnaires' diseases. Ear infections: Otitis media and Otitis externa, mastoiditis. Oral infections: Gingivitis, Vincent's angina. Skin & Soft tissue infections: Boils and carbuncles, paronychia, abscesses, pustular acne, impetigo, cellulites, erysipelas. Gastrointestinal infections: Cholecystitis, staphylococcal enterocolitis. Prophylaxis: Pre- and Post operative trauma, burns, rheumatic fever. Other infections: Osteomyelitis, urethritis, gonorrhoea, syphilis, lymphogranuloma venerum, diphtheria, prostitis, scarlet fever. Adult and Child over 8 years: 250-500 mg every 6 hours or 0.5-1gm every 12 hours. This may be increased up to 4 gm daily according to severity of infections. Child of 2-8 years: 250 mg every 6 hours, doses doubled for severe infections. Child up to 2 years: 125 mg every 6 hours. Neonates: 30 - 45 mg/kg daily in 3 divided doses. Elderly: Same as for adults. If administration on a twice daily schedule is desirable, one half of the total daily dose may be given every 12 hours, one hour before meal. Adult: 250 - 500 mg four times daily for 10 - 14 days. Children: 30 - 50 mg/kg/day in divided doses for 10 - 14 days. Pertussis: 30 - 50 mg/kg/day in divided doses for 5 - 14 days depending upon eradication of a positive culture. Streptococcal infections: In the treatment of group A beta haemolytic streptococcal infections, therapeutic dosage of Erythromycin should be administered for at least 10 days. Acne: The usual dosage regimen of erythromycin in the treatment of acne is 500 mg twice daily for 3 months. Then the dose is to be reduced to 250 mg twice daily for another 3 months. Early Syphilis: 500 mg 4 times daily for 14 days. Uncomplicated genital Chlamydia nongonococcal Urethritis: 500 mg twice daily for 14 days. Prophylaxis: In continuous prophylaxis of streptococcal infections in person with a rheumatic heart disease, the dosage is 250 mg twice daily. When Erythromycin is used prior to surgery to prevent endocarditis caused by alpha haemolytic streptococci, a recommended schedule for children - 20 mg/Kg 1.5 - 2 hours pre-operatively and 10 mg/kg every 6 hours for 8 doses post-operatively. For adults, the dose is 1 g, 1.5 - 2 hours pre-operatively and 500 mg every 6 hours for 8 doses post-operatively. Generally erythromycin is well tolerated and serious adverse effects are rare. Side-effects are gastrointestinal and are dose-related. They include nausea, vomiting, abdominal pain, diarrhea and anorexia. Mild allergic reactions, such as urticaria and skin rashes have occurred. Serious allergic reactions, including anaphylaxis may occur. 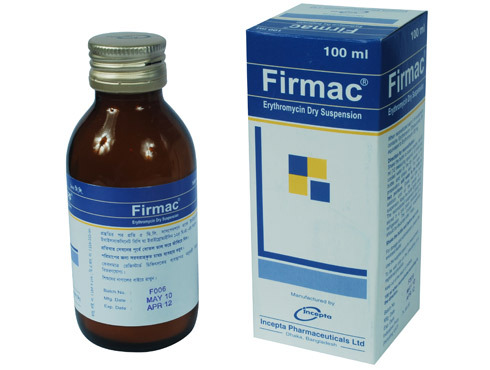 Since Erythromycin is metabolized principally by the liver, caution should be exercised when erythromycin is administered to patients with impaired hepatic function. There have been reports of hepatic dysfunction with or without jaundice occurring in patients taking oral Erythromycin. Pregnancy: There are no adequate and well-controlled studies in pregnant women about administration of Erythromycin therefore; this drug should be used during pregnancy only if clearly needed. Lactation: Erythromycin is excreted in breast milk; therefore, caution should be exercised when Erythromycin is administered to a nursing woman.